Flora Fyrdraaca wants, more than almost anything, to become a Ranger. She wants to go on missions, to work the magickal Current, to have adventures, and to be – as much as possible – like her hero, the greatest Ranger of them all, Nini Mo. Unfortunately, Flora's parents have other ideas for Flora; they expect her to continue a family tradition of attending a military academy and then going into the army. Flora has no interest in pursuing an army career. She's going to be a Ranger – somehow. In order to become a Ranger Flora needs to learn Gramatica, the language of the Current. Once she knows this she will be able to make Invocations (cast spells) to her heart's content and she will finally be able to begin her journey towards becoming a Ranger. Learning Gramatica is not going to be easy however because, it is not taught in Flora's school and she cannot get her hands on a book to help her. Furthermore, her parents are very apposed to magickal doings of any kind. Flora is going to have to get herself either a book, a teacher, or both. She is also going to have to do this in secret. And so Flora sets off to try to get herself a teacher, and to say that she gets herself in a sticky situation is an understatement. First Flora and her friend Uno go to a club so that Flora can meet someone whom she hopes will take her on as a student. 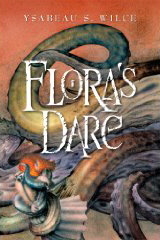 Only Flora ends up getting grabbed by a tentacled creature while she (Flora) is in the toilet. Later Flora learns that the monster is actually a magical being called the Loliga, which is trapped inside the body of an enormous squid. The Loliga is living under the city of Califa, and her movements underground are the reason why Califa has been shaken up by numerous earthquakes of late. The Loliga is pregnant and will soon be giving birth. When she does bring her infant into the world her movements will surely destroy Califa once and for all. Wanting to save her family and her city, Flora joins forces with Lord Axacaya – an old foe of her father's. She hopes, if she acquits herself well, that Lord Axacaya will take her on as a student and that she will finally be able to learn Gramatica. Of course, being Flora, things do not go as planned at all. In this second Flora Fydracca book Ysabeau S. Wilce takes her readers on another wild ride in a strange and fantastic world where men wear quilts and makeup, and where magical - and often unfriendly - creatures pop out of the woodwork. Readers who enjoyed Flora Segunda will greatly enjoy this often deliciously bizarre continuation of Flora's story. The story is not only funny, completely unpredictable, and full of strange characters, but it also shows readers that people, and situations, are often not what they seem. Sometimes you have to dig deep to really find out what the truth is.